you get to see the real Greta Garbo in all her complexity. This performance will haunt you well after you've seen it." - Cheryl Wiesenfeld, Tony Award winner "Elaine Stritch at Liberty"
What is the Garbo Dreams play? 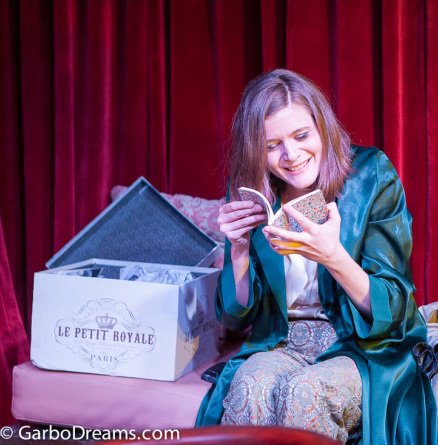 Garbo Dreams is a theatrical experience about the life of Greta Garbo. ​Miss Garbo brings the audience into her living room and private world. How is Garbo Dreams presented? Garbo Dreams is presented in a “living room style.” Wardrobe and props remain consistent, but the setting of the various performances are adaptable to homes, salons, lounges, and parlors. The setting becomes as intimate as a visit to Garbo’s own home. Garbo Dreams is performed as part of exclusive, private events. Past performances have included private residences, membership clubs, charity events, corporate engagements, universities, and real estate events (tenant amenities and prospect gathering). Garbo Dreams has occasionally been performed as a public event, but that is rare. For updates and public tickets, please sign up for our mailing list. "#Garbo laughs. #Garbo cries. #Garbo lives. #Garbo dies. And you will too, when you see @GarboDreams"
What kinds of performances does Garbo Dreams offer? Who might book Garbo Dreams? "Lauren brings an iconic woman to life and makes one feel as though they were an intimate friend of Garbo. Invite her to your space- and feel the magic of insider time travel to Garbo's last days." Greta Garbo doesn’t know it yet, but she is in her final year on earth. Lonely, she spends most of her time secluded in her home, cracking jokes and telling stories to her imaginary friends in the form of two toy troll dolls, a plastic snowman, and a painting. Greta is confronted with her final task: to destroy a small box, which contains mementos of her life and loves. Will she have the courage to burn them—or will she have to face the part of herself that hides from the world? In this hilarious yet poignant portrayal, Greta finds that although her life is aflame, her heart it still intact. How do I book Garbo Dreams? Please email garbodreams@gmail.com with inquiries. Get Project News + Updates!